This long white scarf has a number of different uses; it can be used as an aviator scarf for pilots, aviators, and flying aces of World War I and World War II. It is often used by our directors for Snoopy as the famous World War I flying ace fighting off the Red Barron in “You’re a Good Man Charlie Brown”. You can also use it as a formal scarf to go with a tuxedo costume or as part of an old time driving costume. 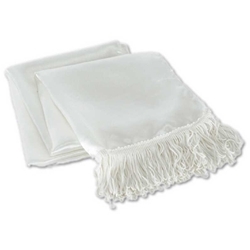 The aviator scarf / formal scarf is made of white satin with white tassels and measures 60” long by 5” wide.